Prepare your mind for awesomeness. The internet has offered many humorous gems over the years that have enriched my life and made me grateful to have wifi. But this video...this TOTALLY 80s VIDEO...takes the cake and adds twelve layers, chocolate filling, and neon florets with sparkler centers. From Samurai Studios, Inc., the group that brought you nothing you've ever seen before, this four-and-a-half-minute anthem brings us everything we loved about the 80s: big hair, electric hot pants with blouses and high heels, synthesized background instruments, rockers in headbands, cheesy green-screen action, aerobic routines masquerading as choreography. 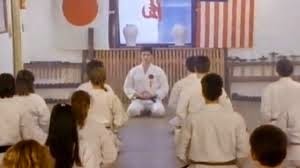 And did I mention the song is about karate? And performed by a Caucasian married couple? And features a rapping parakeet? And begins with the spoken words, "Relax and breathe"? Oh, yes. It totally does. I should also thank David Seeger and Holly Whitstock Seeger for conceiving and birthing this eighth wonder of the world. And I must thank my brother David for constantly filling my coffers with ill-conceived, hilariously executed music videos. You may thank me in the comments.